Protection of the human environment and sustainable development of the world increasingly manifest themselves through negotiation and enforcement of internationally agreed legal rules and standards. International environmental negotiation has become a common format to design norms that affect national and international legal orders and influence the behavior of various stakeholders. Accordingly, international environmental negotiations attract multiple players: from sovereign States to environmental NGOs, to the business community and civil society. The growing complexity of international environmental negotiations demands, in order to make the process effective, a comprehensive and adequate preparation of all actors. 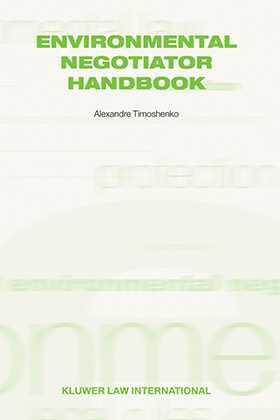 The Environmental Negotiator Handbook is designed as a single volume tool that equips participants of international environmental negotiations with a structured description and analysis of the negotiating process. All stages of the development of international environmental agreements are carefully followed, researched, commented on and illustrated with multiple documentary examples. The book traces the process from the pre negotiation stage to actual implementation of the agreed regime. The book also includes a large collection of essential international texts to be at hand for representatives at international environmental negotiations. This volume is aimed at a wide range of readers, including government officials, staff of relevant intergovernmental organizations and secretariats, non governmental organizations, practicing lawyers and academic scholars. The book is based on thirty years of the author¿s career in international environmental law.